Two important things in one picture. 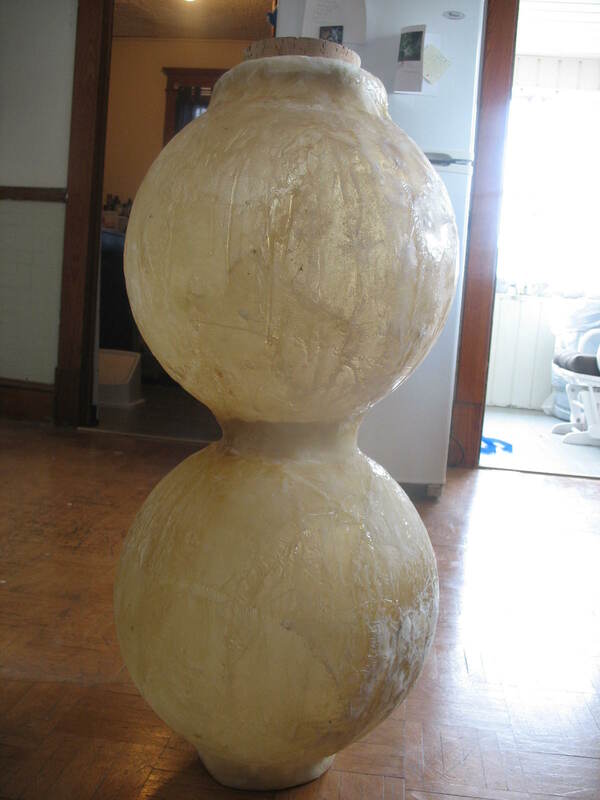 First is the gourd itself - here it is in its completed resin state. 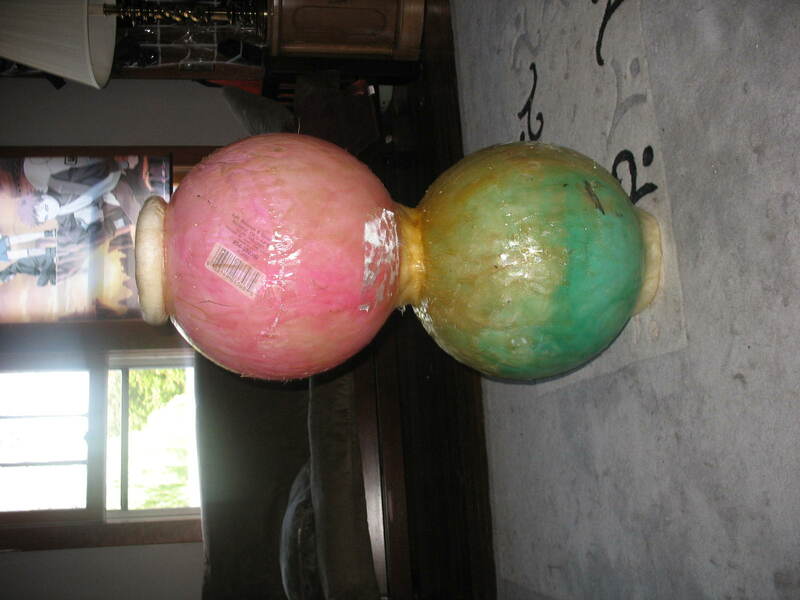 The entire gourd has two layers of resin soaked fiberglass cloth on it. It is nigh-on indestructable in this state as I can well testify to, it can survive anything I've accidently done to it so far! The small green ball on top of the gourd is actually a replica in a sense. 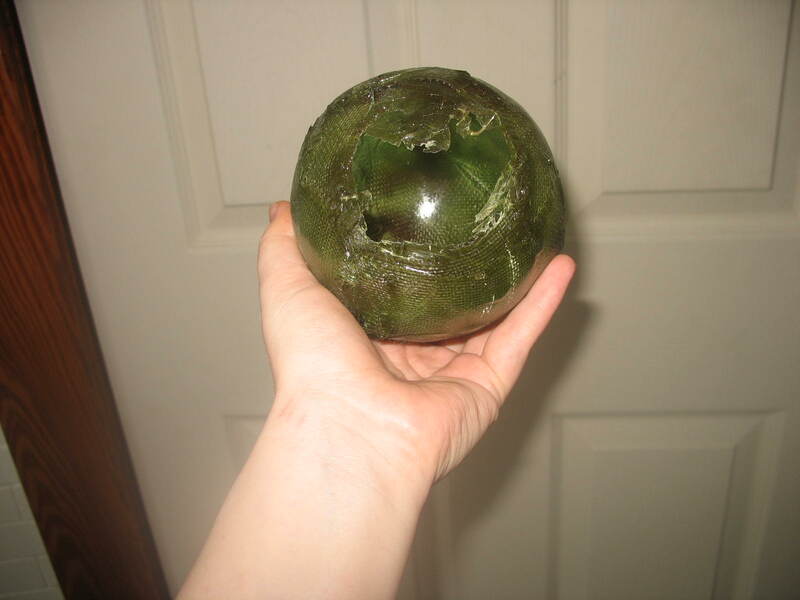 It is also a plastic-rubber ball wrapped in fiberglass and resin, albeit only one layer. It was to do a very important test. I had to make sure that the resin had not chemically bonded to the plastic-rubber ball inside, as was my fear, and that only two layers would survive losing its internal base. One knife stab later, we had proof that indeed the gourd would survive the ball popping. So, the two interior balls were popped and carefully removed along with most of the clay that had been supporting the two balls together. 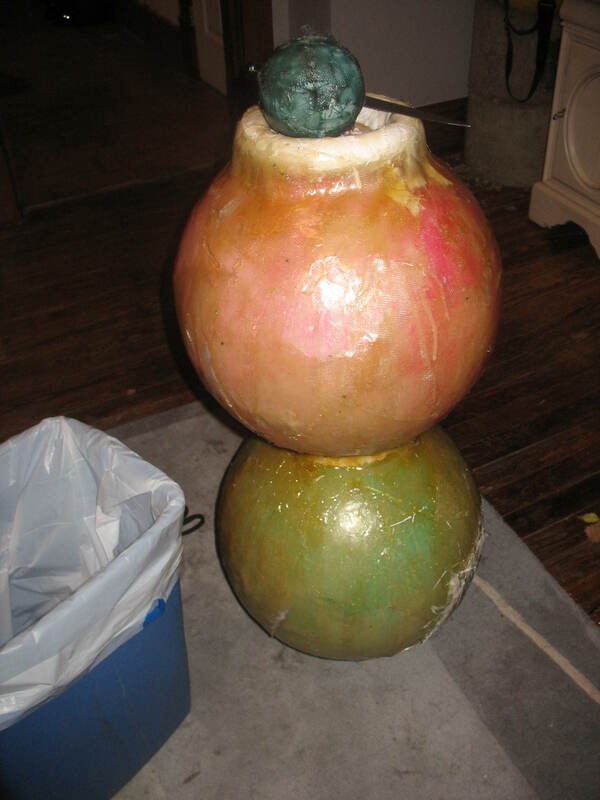 Here is the gourd after it has not only been popped (you can see through it slightly) but sanded as well. Sanding took probably a good two hours with an electric sander, sand paper, and a dremel. 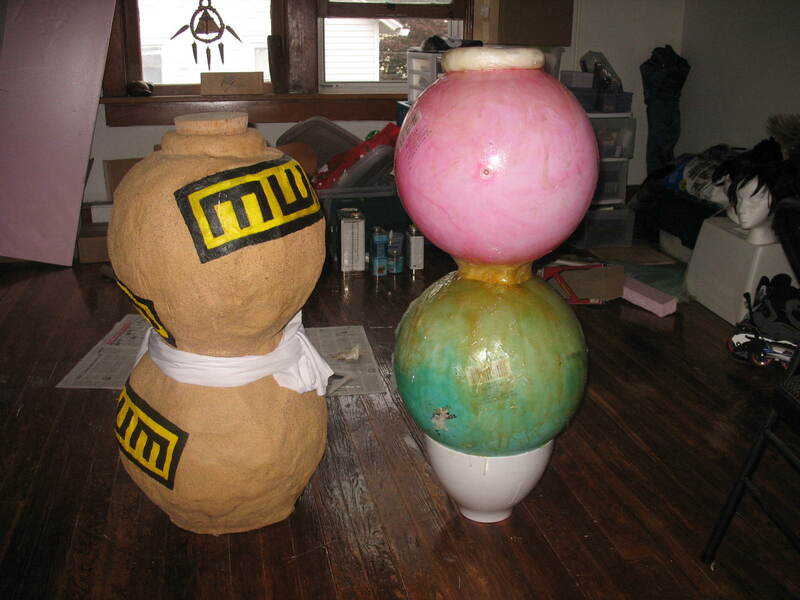 After some experience with the spray paint I chose to do the sand-texture and final color, I knew that painting the gourd before hand would be a huge time and money saver. So I went to my local hardware store and for 9 bucks picked up a hand-picked can of colored paint. I would go with a darker/more orange color next time, but it turned out good enough! Unfortunately, I missed a picture here so I will explain. The first painting is never the final one. Painting brings out every single defect in the resin surface - a hole here, a missed drop here, a rough spot there. So some plaster was required to fill in the rough spots. Tiny holes were filled in, gaps between places where the resin ran, edges that weren't quite smooth. Then, a final layer of paint was put on to cover the plaster and that is what you see above. 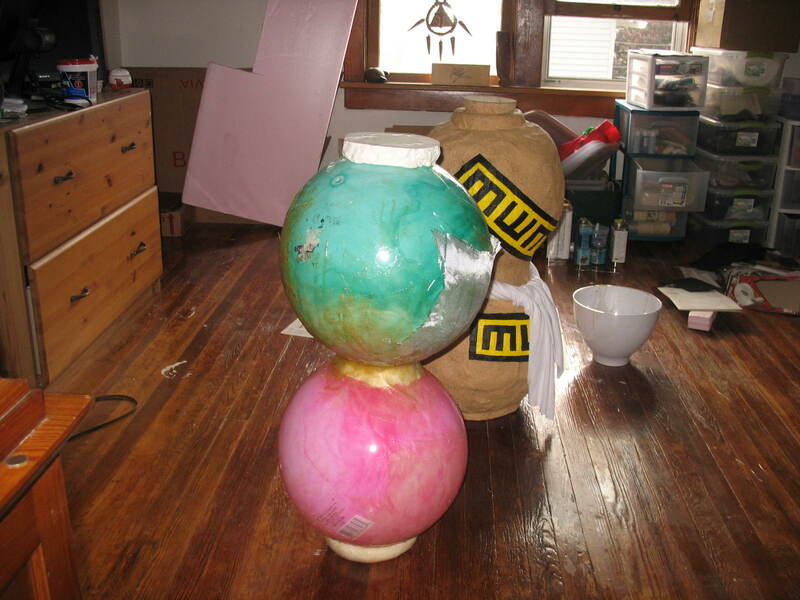 Here, in my very messy cosplay room, you can see the final spray painting job on the v.2 gourd as compared to the v.1 gourd. With the layer undercoat, the gourd turned out slightly less orange in color, plus I did a spritz of a secondary textured sand color to give it some black flecks in it. And here, the final picture of the completed gourd. 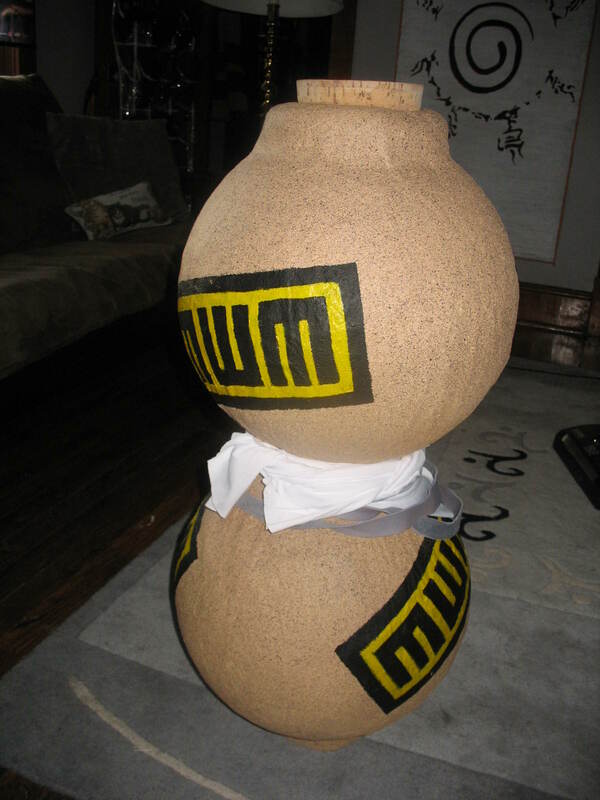 It has the large cork in the top, the MWM symbols painted on (there are four of them) and the white wrappings + temporary harness wrapped around its middle. All in all, pleased with the project. Have some ways to save money now, and a definite on just how quickly I can make one. There's no way to save time on how long it took - I did it in record time and other than problems with the weather there was nothing I could have done to take less time. Next time a darker/orange underpaint will be used to enhance the color. This project is one special to my heart. 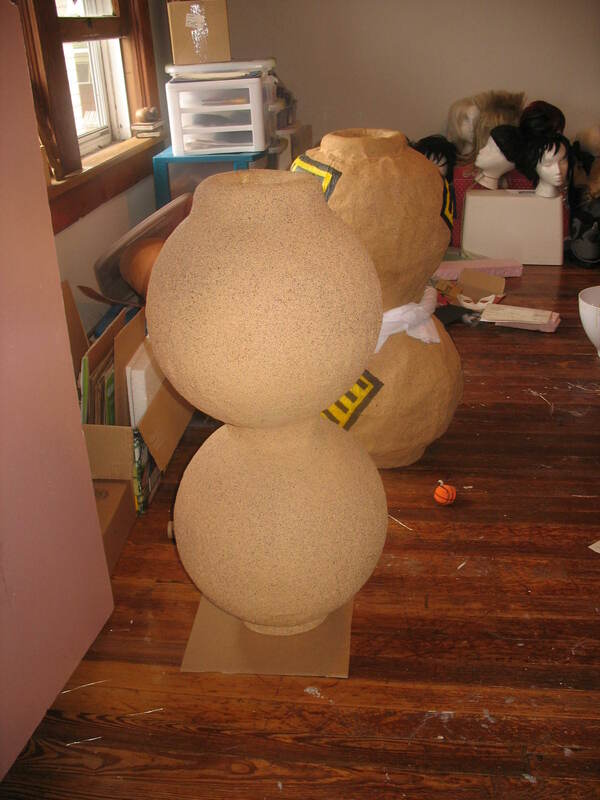 I created the first Gourd back in 08 when I had almost no idea what I was doing, simply giving something new a shot when I was in a cosplay funk. It became a difficult, aching project that both worked beautifully... and was a failure... in the same shot. It looks absolutely perfect, and I'm pleased for that, but it is very large and heavy - and impossible to carry on my back. So, I always wanted to redo the whole project. So here I am, two years later, with a similar but different attempt at the same project - this time, keeping careful track of time and money spent. My apologies that the pictures all end up on their side. Here's the first attempt at getting things started. It was 5 dollars for the two large bouncy balls. Between them is a 1/4 of a $20 dollar box of model magic that'll form the neck of the gourd. 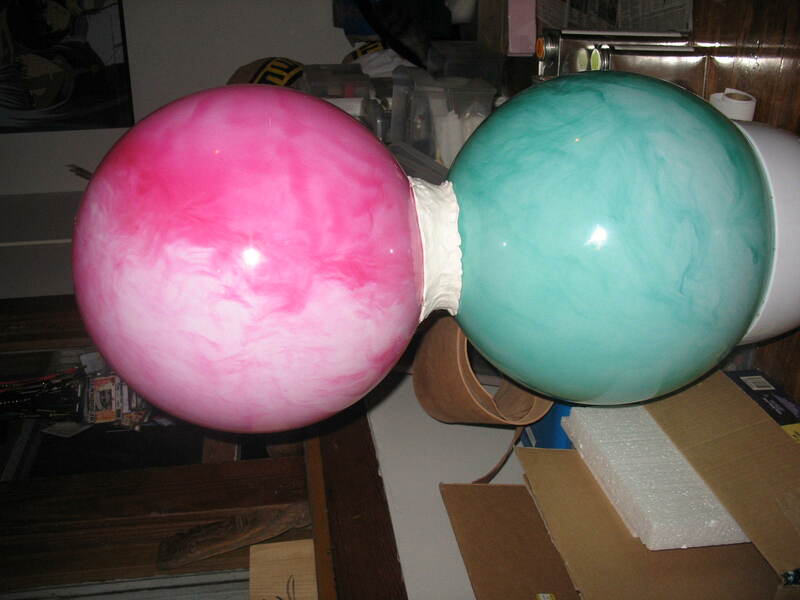 On the bottom isn't a base, just a large bowl I use for resin work. This is the neck between the two balls, the top ball, and the ring of clay that'll be the opening of the gourd with its comically large cork inserted. Yep, it's a real cork that huge! The very first batch of resin work. That'll be that lovely brown-yellow stain on the green ball. I started with the neck between them as it needs the most support and will keep me from cursing every time the two balls fall apart. I was glad to quickly remember some of my resin-ing skills from two years ago. 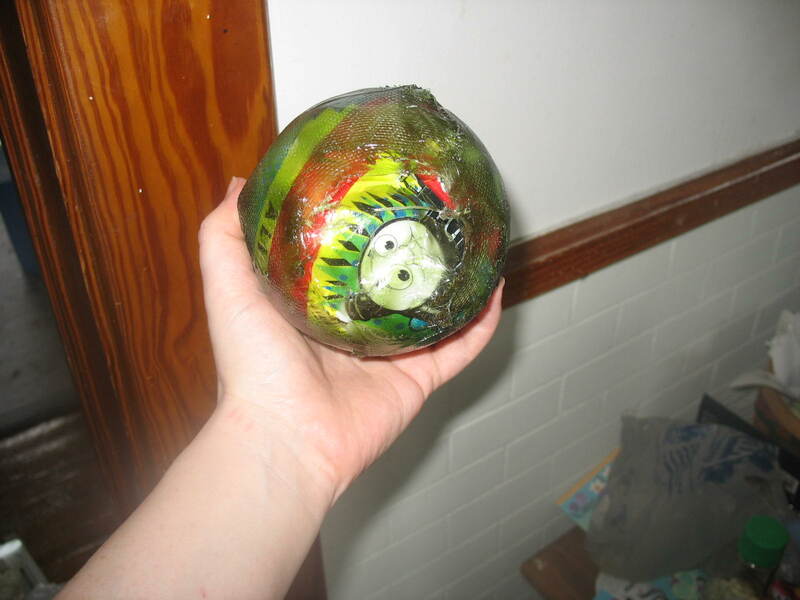 I also learned that I needed at least two layers of cloth/resin to make the ball hard enough you could no longer press inwards/the ball was squishy. Beside it is the original gourd. You can see the size difference in the two like this. They're actually just about the same height! 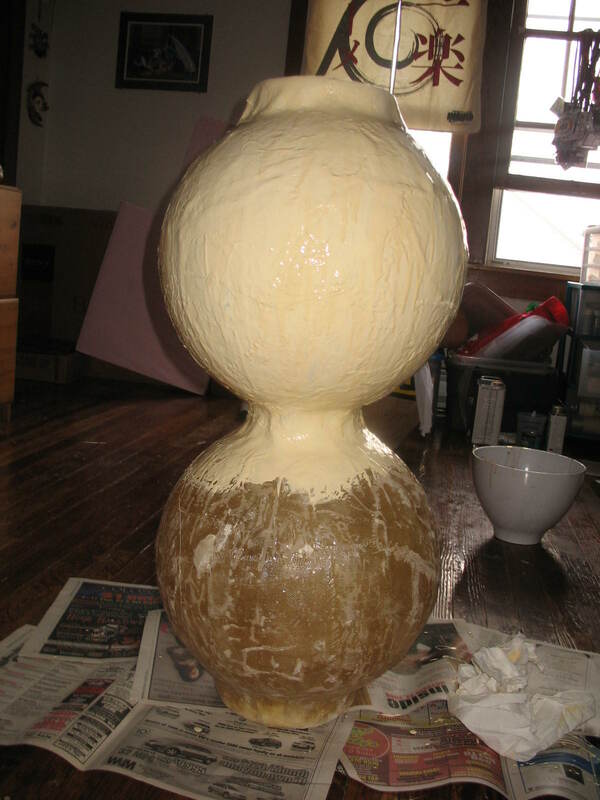 Addition of more resin - the gourd is upside down to let the newly formed clay base dry. You can also see the fiberglass cloth that I didn't have enough resin to lay down but was already stuck to the gourd - that'd be the white along the side. 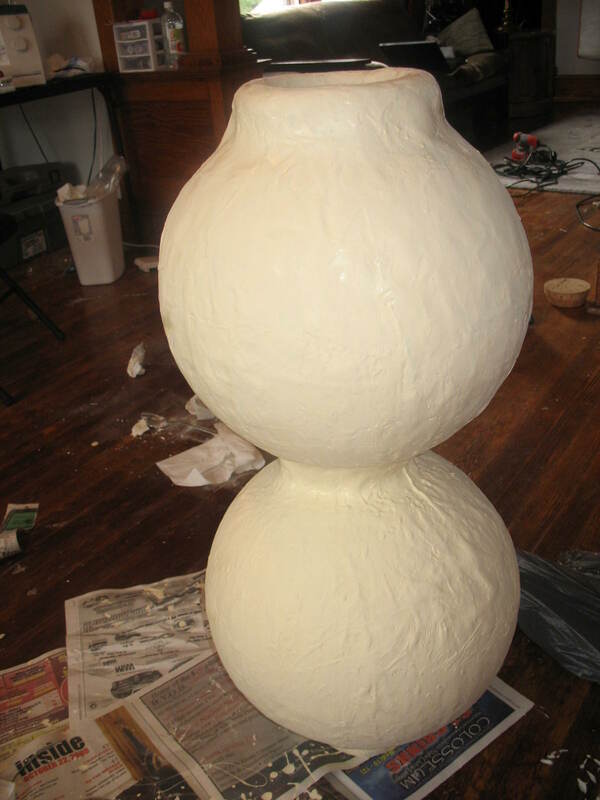 One weekend's worth of fiberglass+resin. The bottom ball is pretty much done - I'll be double checking it tonight for any 'weak' (squishy) spots and laying over patches if needed. 50% of the top ball has its first layer of resin+fiberglass and 25% has two layers (closer to the neck) so I'll be doing that next. This gourd is far, far lighter than the original gourd even with the clay and balls still in it. Keep an eye out for further developments!